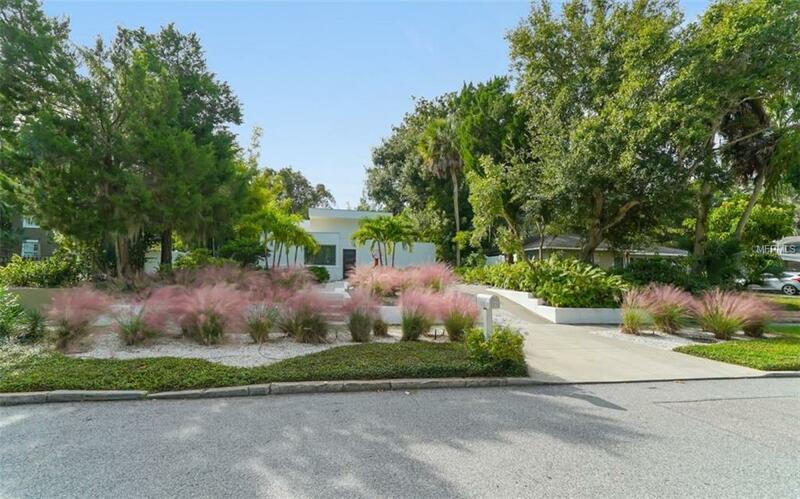 Welcome to an exceptional, opportunity to own an architectural masterpiece created by Ralph Twitchell, the father of Sarasota School of Architecture, alongside his protg Paul Rudolph. The home was designed in 1940 built in 1941, then fully and painstakingly remodeled and expanded in 2009 by James Bowen to adhere to the original vision and aesthetics, while accommodating todays living and modern amenities. Now, virtually brand new, the 3BR residence uses an abundance of space, walls of glass, 12 ft volume ceilings, natural light and meticulous touches to present a triumph of creativity and innovation all in a setting reminiscent of Selby Gardens. A specially commissioned sculpture greets visitors by the solid mahogany front entranceway, as custom European LED lighting and gleaming polished concrete floors flow throughout the split floor plan. An additional room off the second bedroom used for storage but could covert to an office or hobby room. The open chefs kitchen is features, Caesarstone counters, a built-in desk/island, gas cooktop, breakfast bar and all upgraded appliances combines. From the dramatic gathering room or master bedroom escape to the open marble pool deck with waterfall where lush landscaping and privacy fencing create a haven of sumptuous beauty. An air-conditioned pool cabana is currently used as an inspirational art studio. This unique property is located in the historic Sapphire Shores neighborhood, just moments from downtown Sarasota, Gulf beaches and Bayfront Beach Park.